This article describes general issues about cyclecomputers and GPS -- starting with a brief history, and serves up some thoughts about the limitations of measurement as they apply to bicycling. A companion article, the cyclecomputer database on this site, links to owner's manuals for cyclecomputers and GPS units. Another article describes how to calibrate the wheel sensor of a bicycle computer or GPS unit in the easy way -- or in more difficult and more accurate ways. Today's digital bicycle computers and GPS units are great stuff, but accurate measurement of distance on a bicycle is nothing new. Long before the computer age, a mechanical cyclometer (odometer) with a star wheel driven by a striker attached to a spoke would give consistent readings -- unless driven too fast so the star wheel overshot (invention patented by Albert Rockwell of Bristol, Connecticut, USA in 1900). The star wheel would make an annoying click-click-click with every turn of the wheel, and paper calculation might be needed to correct distance readings. A super-accurate version totaled up turns of the wheel one by one, and was used to measure racecourses. There is a modern version, the Jones Counter, gear-driven for greater reliability. 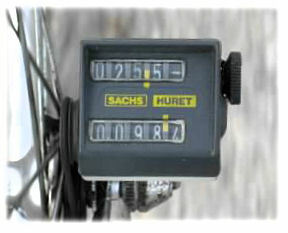 A more recent development in odometers (1970s-1980s), the Huret Multito, took a step forward in user-friendliness, and a big leap backward in accuracy. The Multito, as the name suggests, could record both total distance and trip distance. The Multito was driven by a silent, rubber O-ring belt whose ratio would vary with temperature and humidity. A story still circulates in our bike club of a member with a Multito who rode repeatedly around the block, amusing finishers at the post-ride picnic, to assure himself that he had completed 100 miles. Before the advent of GPS, many bicycle-club recreational routes were laid out by travel in motor vehicles, whose odometers could be off by 5% or more, depending on what tires happened to be installed. Some route listings still use that inaccurate information. There is a way to improve even car odometer readings, and we'll describe it. Bicycling entered the computer age with cyclecomputers in the late 1980s, and with the Global Positioning System (GPS), around 2010. Cyclecomputers and GPS have different advantages and disadvantages. Cyclecomputers are generally inexpensive, compact and light in weight. Batteries last for a year or more. A cyclecomputer offers speed, distance and time information, but no location information. You must depend on a map, cue sheet or your knowledge of the area to chart your course. The distance reading is taken directly from the road, and can be very accurate, but it is never exactly repeatable. A GPS unit is expensive, relatively bulky and heavy, and can run down its battery in a few hours. To last through a long day of riding or a multi-day tour, a GPS unit needs an external power source: battery, solar charger, or hub generator. The leading GPS brand in the USA for cycling is Garmin. Mio (also sold under the Raleigh and Ciclosport brand names) is popular in Europe. A smartphone can serve as a GPS unit, but has the same issues with battery life, expense, bulk and weight. Mounting it on the handlebar requires a bracket, sold separately. On the other hand, many people already have a smartphone. GPS units for use in motor vehicles give directions to a destination, but GPS units and smartphone GPS apps for bicycling can also work with a home computer to upload and download routes, give an estimated time of arrival on the chosen route -- etc. A smartphone can also download directly from the Internet. Many popular bicycle routes are being published on the Internet in a standard GPS format. The premier Web site with this information is ridewithgps.com, where you can also develop a route entirely on the computer, to download as a map, cue sheet, or GPS input. A GPS unit with a permanently-installed, internal, rechargeable battery is preferable over one with AA cells, which can disconnect due to vibration and lose data. Either a cyclecomputer or a GPS unit may offer additional information such as heart rate, altitude, pedaling cadence, power output, and an estimate of calories burned, and make it possible to download this information to generate a training diary. Recreational cyclists tend to have GPS, or aspire to it. Many bicycle clubs are storing favorite routes online. Increasing numbers of riders show up at the ride start with the route programmed into a GPS unit or smartphone. Racers, on the other hand, may favor a cyclecomputer, because of its light weight and because the race or training route has already been laid out for them. Reading route information from a screen when elbow-to-elbow in a racing pack wouldn't be a bright idea in any case. Great accuracy and repeatability in measuring distance are important for some purposes, for example, to measure a racecourse. Then professional surveying work is the benchmark -- though, still, it may not accurately represent the path which cyclists take around curves. Cyclecomputers and GPS units, on the other hand, are practical for cyclists to record speed and distance during a ride. Many if not most cyclists set cyclecomputers to a default value for wheel size, which can easily be off by 2% or more. GPS also has accuracy issues. Greater accuracy is easy to achieve, and it has real benefits. You may want an accurate reading so you can report that you've met some personal goal, like our friend with the Multito. You may want to know the distance to the end of a bicycle club's loop ride, or to reach an overnight stop on a long-distance touring route, or to the finish in a race. If you are following a cue sheet or touring route, it is very helpful to know when you are approaching the next turn, so you'll be on the alert for it. If you are developing a map or cue sheet, you would like to record accurate mileages. The good news is that a with a bit of fine tuning, even a modestly-priced cyclecomputer can measure distance with impressive accuracy -- much better than most people achieve, though the cyclecomputer lacks the bells and whistles of a GPS unit. All GPS units and smartphone apps which read from a map database will give the same distance on roads or paths included in the database (usually the Google database, in the USA) -- though the database may be slightly inaccurate because it does not precisely indicate the location of the roads or paths, or the a cyclist's position on them. The traveled distance will be slightly shorter than the GPS database on a winding route where cyclists cut corners -- but the indicated distance will always be the same, and you won't get complaints from GPS users. So, all in all, GPS using a map database is the most satisfactory system to identify turn locations and distances on a route on roads. 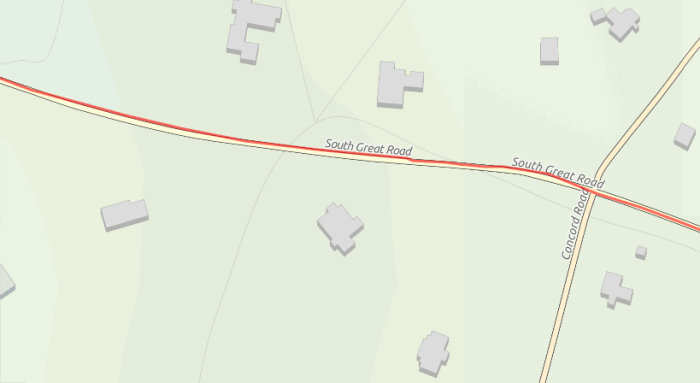 The map below shows a segment of a bicycle ride entered into RidewithGPS.com directly from a home computer by clicking and dragging cue points along roads on a map. The route follows the road quite well, except that the ride was from west to east and on the right side of the road. It may be that some of the Google data was from a Google camera car traveling westbound. For off-road routes and others not included in the database, GPS is less repeatable. Satellite-signal travel time changes with atmospheric pressure and temperature, resulting in location error. GPS readings wander by as much as a few meters due to turbulence in the upper atmosphere, resulting in a "drunken sailor" line of travel and an increase in measured distance. The slower you go, the more wandering, and the less accurate the measurement. A friend once showed me (John Allen) that his GPS watch had recorded over 100 meters of travel during an hour when he went nowhere. 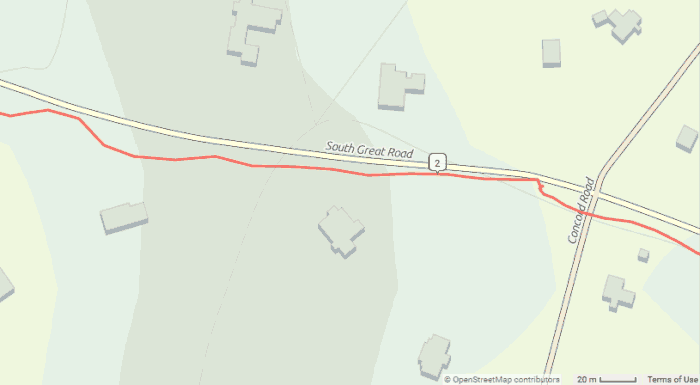 The image below shows the same ride segment as the one above, but recorded from a smartphone into RidewithGPS.com with a basic (free) account. The GPS route, consisting of straight-line segments between GPS readings, wanders as far as 15 meters away from the road. The little knot west of Concord Road is from GPS wander while waiting in line for a traffic light. The next image shows the same GPS readings against the background of an enlarged section from a scanned US Geologic Service topographic map. The image is blurry, because the topo map is not available in such high resolution as the Google data, but the bicycle ride more nearly follows the road. The old USGS mapping here, taken from aerial photographs, is evidently more accurate than the Google database, taken from satellite imagery. Or maybe the USGS mapping just more nearly agrees with the GPS data recorded during this ride! Of the nine map backgrounds which RidewithGPS offers, the USGS topo map is the only one which places roads slightly differently-- the only background not derived from the same survey data. GPS requires a line of sight to earth satellites, and this can be interrupted by tunnels, cliff walls, buildings or overhanging vegetation. If the GPS unit loses contact, it will generally fill in the missing stretch when contact is restored -- using a mapped route, or if none is available, a straight line. To maintain speed and distance readings in such situations, many GPS units optionally can take input from a wheel sensor. This may be calibrated automatically from GPS readings, or it may need to be calibrated manually like a cyclecomputer. A cyclecomputer uses only a wheel sensor to calculate distance. Cyclecomputers, and even mechanical odometers, excepting the Multito, are digital devices. They usually give the same reading for the same number of turns of the wheel. But the wheel is an analog device: there are no gear teeth where the rubber meets the road. Inaccuracy of the internal math converting kilometers to miles, or vice versa. Avocet cyclecomputers with inductive sensors' not recording at very low speeds -- up to about 2 mph (3 km/h) -- walking speed up a steep slope -- or worse if the sensor and magnet ring are misaligned -- because the sensor does not send a strong enough electrical signal. The computer's calibration to tire size can be adjusted -- and precisely -- a user-serviceable feature. 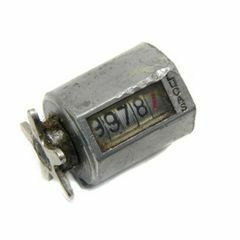 On motor vehicles, the odometer has to be a "black box" to prevent tampering. Many bicycle computers display 1/100ths of a mile or kilometer. On a bicycle with road tires and the sensor on the front wheel, it is possible to get accuracy to better than 1/2 of 1% ( less than 1/2 mile in 100) and probably as good as 1/10 of 1% -- just as good as with a decades-old star-wheel cyclometer, a pad of paper and a pencil! A cyclecomputer provides the most accurate measurement if it uses no internal conversion between miles and kilometers (computers in our Group E/F) or if its conversion factor can be determined. A manufacturer may give the same calibration number when the computer is set to display miles or kilometers, but the recorded distance in miles may differ due to a rounded conversion factor, for example 1.6 : 1, more than 1/2 of 1% different from exact 1.609344 : 1. Reduced to the least common denominator, that fraction is 25146 / 15625, possibly too complicated for the wimpy processor in a bicycle computer. Manufacturers (except Avocet) have not provided information about their conversion factor -- Avocet's is 1.6 : 1 for the ring-magnet cyclecomputers. If you don't know the conversion factor, and the computer inputs tire size only in millimeters, you may want to do a different measured distance test for miles and kilometers, or measure a course in kilometers and convert to miles on a spreadsheet when you get home. The conversion factor could be tested by driving two identical computers from a phonograph turntable (78 RPM is good, results come faster that way), until one computer reports 156.25 miles. 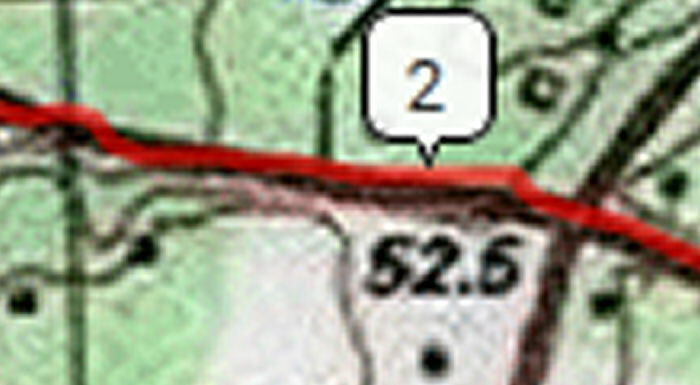 The other computer, set for kilometers, should read 251.46 kilometers. We have run a test of this using computers of the same brand, and written an article about this. The conversion was not exact!. If calibration is inaccurate, you can still make corrections with a bit of math -- mentally, on paper or using a calculator, as described on our page about cyclecomputer calibration. This works even for highly-inaccurate automotive odometers. Random error still remains: as stated earlier in this article, analog measurement is not perfectly repeatable. Weight loading, tire inflation, tread wear, tire stiffness, riding surface conditions and cornering all affect it, as already described. A GPS unit can read altitude from GPS signals. Some cyclecomputers, GPS units and smartphones have altimeters which read atmospheric pressure. However, as already mentioned, GPS readings wander as radio waves are bent due to atmospheric turbulence. Also, atmospheric pressure may vary during a ride, affecting altimeter readings. Unless a ride has only a single, simple climb and descent, the interesting measurement for cyclists is of elevation gain (feet or meters of climb) for all the climbs during a ride, as an indication of the ride's difficulty. But elevation gain is a fractal measurement. The amount recorded depends on how often a measurement is taken. Small, repeated ups and downs, whether real or due to GPS wander, will register more elevation gain on a device which takes more frequent readings. For that reason, readings taken during a ride will typically record more elevation gain than an online map, whose elevation data may consist only of contour lines at intervals of 20 feet, or 10 meters, or more. GPS distance readings on mapped routes are generally very accurate, because the distance covered is long compared with GPS wander, and the GPS maps straighten out the wandering GPS track. Elevation-gain readings can be very inconsistent, though, because the changes in elevation are smaller, and slower.. Also, you will often find that a loop route shows a slight elevation loss, because waypoints are more likely to be recorded nearer the top and bottom of a slow climb than a fast descent. What really matters to a cyclist is the amount of extra effort expended in climbing, and that varies widely also. Riding fast downhill in an aerodynamic tuck saves more energy for the next climb, but it is not always practical, or safe. Though a figure for elevation gain can give a general idea of the difficulty of a route, a power meter, not an altimeter, can take an accurate measurement of effort.